Please, give back function "use system color on top bar" in browser settings. After update it dosen't work and to be honest, I don't like this bright bar, but I also don't like dark theme. This option with system colour was perfect for me. Yes, this was an odd update. 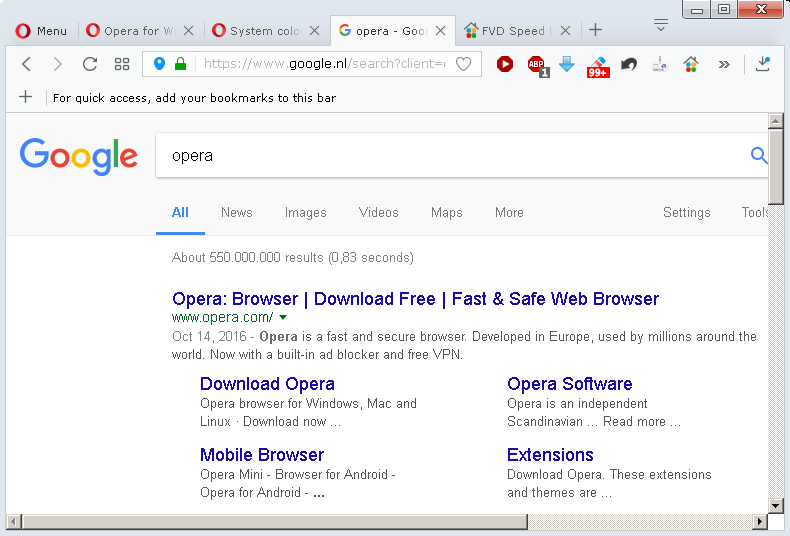 It used to be possible to see if Opera is the active window by looking at any of the four long edges of the window or the window title bar. Now it's only possible by looking in the top right corner. By the next update, perhaps there will be just a single pixel to indicate that the window had gotten or lost focus. 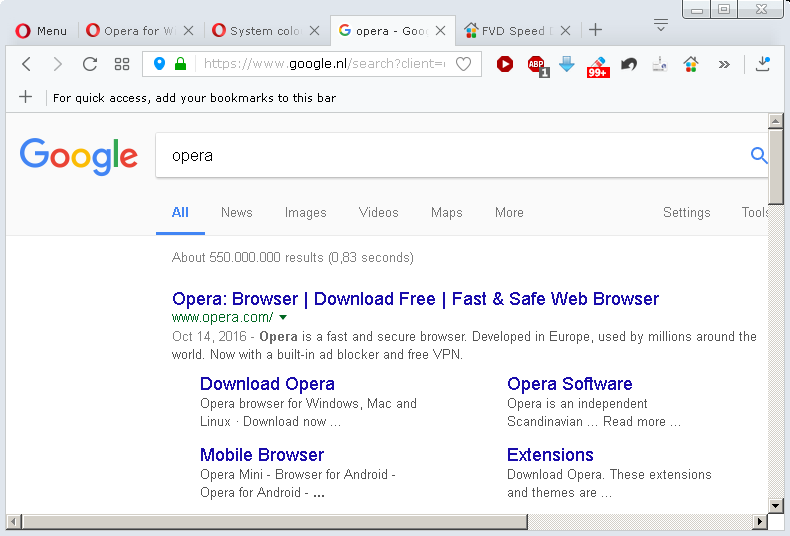 The reasons to keep on using Opera (i.e. ways in which Opera is better than e.g. Chrome) are slowing falling away. Yes, thank you. I was just coming here to post this feedback. 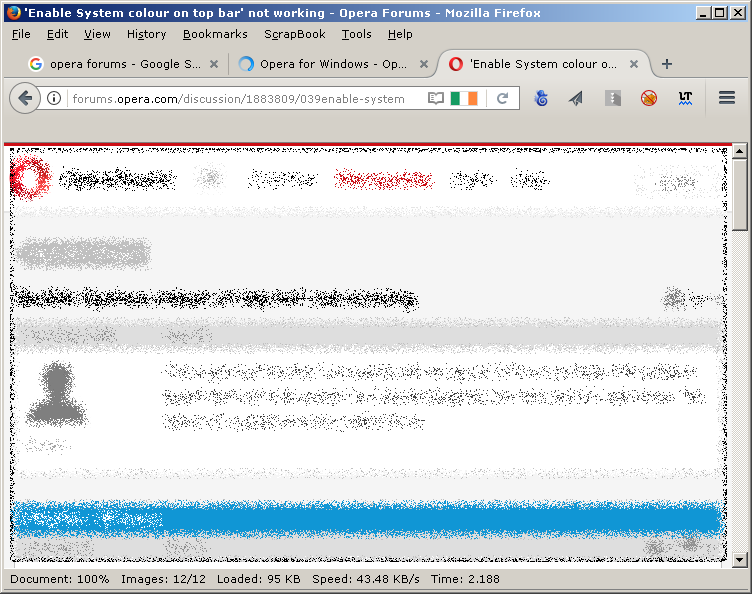 Option to have it where Opera uses the native window from the operating system would be optimal. However at the very least please make it so that opera changes the color or brightness of the titlebar when it isn't the active window. @ugcheleuce - Heh, at least you have that. On Windows 8.1 and 10 the X doesn't change at all with this new Opera. No graphical changes if the window is active or not. It may be a bug or it may be that the setting is outdated. Here (in Windows 10) if the window has focus there is a gray outline around it - and of course the taskbar icon is highlighted. If focus is somewhere else, there is no gray border (and some other icon is highlighted). The option with system colour was perfect for me too. But this function (use system color on top bar) isn't running at v45. 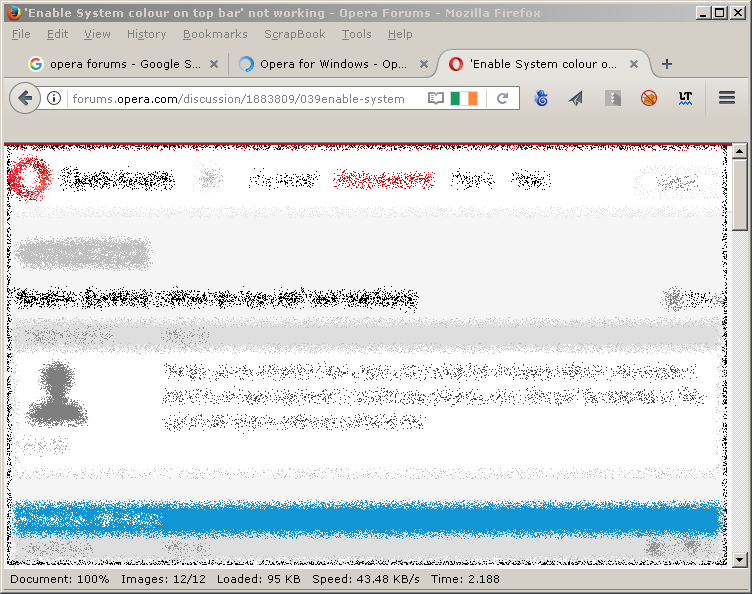 So I returned to Opera 44.0.2510.1457. Unfortunately Vivaldi doesn't respect system colouration either. I am in windows 10 and I don't see the slightest difference in the Opera window whether it has focus or not; with a Chrome window the difference is obvious, though. Yeah this update definitely seems to have broken this feature... Or they removed it intentionally and forgot to remove the GUI setting for it. No matter that is "system colours option" or not (but I preffer it design with my system colour integrity). Clearly difference beetwen active and inactive window was usefull for many users, also for me. Removing this (intentionally or not) is a bad step from Opera. Same problem here. There is no color change for the "system colours option". This function(use system color on top bar) does not work in v45.0.2552.812 either. Same here. The "system colours option" didnt work anymore. Please fix that. Maybe its time to allow users to set own color themes like in Vivaldi. The Dark Theme isnt bad, but it doesnt fit into my own windows 10 design. The same with the Panel Bar / Sidebar. Its just black. It would be nice to change to color too. I DID search. You didn't answer the question here either. If you had searched, you would have found this topic. You didn't answer the question here either. I never said that there would be an answer. The system color option is broken for me as well. Developers, please let us know for certain if this is just a bug that you plan to fix in future updates, or if the option for using system colors on the top bar is being officially phased out. If it is being phased out, you should know that the ability to use system colors was a major selling point for me and a lot of others when windows 10 came out - and that it is an absolute deal-breaker for us as well. A small handful of half-baked “themes” does not even begin to justify taking away truly custom color options - especially now that the latest Windows 10 update is finally letting people use an expanded palette of colors for title bars. Please please PLEASE fix or reinstate! The option was removed in latest developer 46 build. Wow, that is an extremely unfortunate decision. It would be like if Amazon chose to ax their two day shipping option to make room for a 'new and improved' two MONTH delivery service. Giant step in the WRONG direction! I guess I'm switching back to Firefox for now (albeit begrudgingly).